"After a particularly rough landing during thunderstorms in Memphis, a flight attendant on a Northwest flight announced, "Please take care when opening the overhead compartments because, after a landing like that, sure as hell everything has shifted." Man, what a month February was! When we named 2003 year the Year of Duct Tape (1/1/03), we had no idea that it would come to pass! But, thanks to the Department of Homeland Security, Duct Tape has been brought to the forefront of the American consciousness. We did over 80 interviews in two weeks about the sacred roll - everything from CBS Network News to MSNBC's Power Lunch, from the New York Times to USA Today... read our take on the whole phenomenon here: Homeland Security on a Roll. Based on the importance placed on duct tape by the Dept. 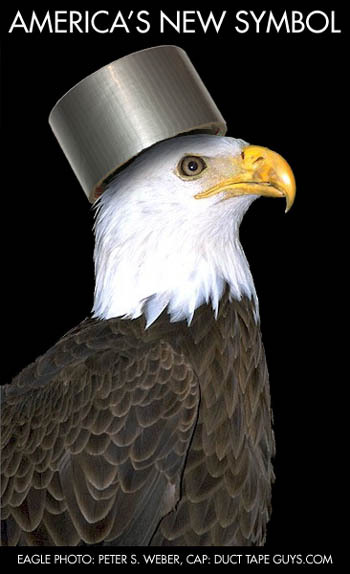 of Homeland Security, we are suggesting this slight revision to the Bald Eagle as the symbol of America. Thanks to Peter S. Weber for allowing us to use his beautiful bald eagle photograph. Check out Peter's other wild bird photos at www.wildbirdphotos.com. Click on the photo to see a larger version that you can grab and pass along to your friends. The Media will need to contact Peter for a royalty-free contract prior to reprinting the image. When will this all end? We hope never. We've always maintained that it's important to stockpile duct tape - because you never know when you will need it. Remember our motto: "It ain't broke, it just lacks duct tape." - which is always important, but especially during these economically hard times. Wear it on your chest! Our shirt (prophetically produced in the summer of 2002) has been selling like hot cakes (or should we say, selling like duct tape). You can order yours at the Duct Tape Pro Shop for just $17 plus shipping. While you are at it, grab our Department of Government Recommended Stockpiling of Duct Tape Special - a book three (autographed) and our video combo and $18.95 retail value for just $10.00 plus shipping. Get it all at the Duct Tape Pro Shop. Jumbo Duct Tape Book Boom! 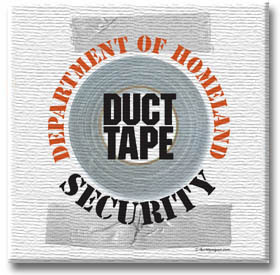 This whole DHS deal has propelled our Jumbo Duct Tape Book sales through the roof! The publisher was just forced to reorder 45,000 more copies bringing the total in print to 336,000! Perfect! Duct Tape Evangelism in full swing! Look for Jumbo at your local bookstore or get it at the Pro Shop. The Duct Tape Guys are looking for your short stories about how you have saved money using duct tape. Submit your savings story (100 words or less) along with an approximate amount of money saved by using duct tape, a photo of the project or repair job if you have one, your name, city/state, and email address. We will select the best stories and post them here. The top three stories will get a nice supply of Duck® brand tape and a set of our duct tape books. Deadline for submissions is April 18th. Winners will be announced in the May issue of Duct Tape: On a Roll. Click here for more information. Gift on a Budget My husband and I were married in December of 2002. Our wedding was three days after Christmas and I really wanted to do something special for my little brother for his gift. We have a large family, so we draw names and buy only one gift instead of 7. My brother is a freshman in college, has a top bunk bed and has no where to sit when he comes home from class. I thought, "It would be really nice to get him a bean bag chair so he wouldn't have to sit on his roommates' beds." Well, did you know that beanbag chairs are expensive? I ruled out that idea and kept thinking. In the meantime, my (now) husband and I kept receiving wedding presents, packed in those little Styrofoam peanuts. I thought to myself, "What a pity that you can't use these peanuts for anything..." Eureka! The idea was born and I finally had a way to be resourceful and give my brother what I knew he wanted. I filled two trash bags with foam peanuts, stuck them together and covered them entirely with duct tape. It feels just like the vinyl on a beanbag chair, and can easily be repaired if it gets a hole in it! 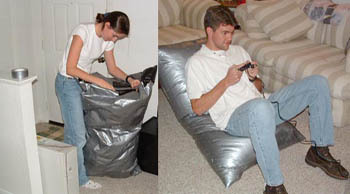 I mean, that's how people fix beanbag chairs anyway... duct tape! Jump Start I recently had defibrillation training (you know the keen little machine that can save lives) and learned that the defibrillator pads might not stick to a hairy chest. Duct tape to the rescue!!!! Grab the duct tape, stick it on the chest hair and then rip it off, and then go going to save the person's life!!!!! I am in the environmental protection business, and we use duct tape to seal our Tyvek suits and full face air filters!!!! --- Reggie from PA We're thinking that pulling the duct tape off of a hairy chest alone will jump start the person! Check out our other medical uses. It's HMO on a Roll! This month we said good bye to a friend. 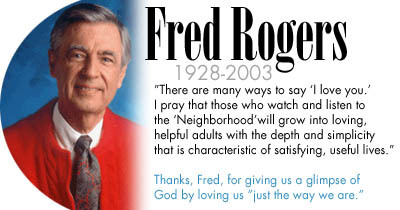 When asked what he felt was most important to him, Fred Rogers said, "Our neighbors are those we happen to be with at the moment. Life is for service. We human beings are meant to be helpers. In fact, the greatest thing we can do in life is to help our neighbors come to know that they are lovable and capable of loving. Anyone who truly knows this will not lose hope - and therefore will not resort to violence." Thanks, Mister Rogers - we'll miss you, but you will live in all of the hearts you've touched. 18) My daughter was absent yesterday because she was tired. She spent a weekend with the Marines. 19) Please excuse Jason for being absent yesterday. He had a cold and could not breed well. Each year the Washington Post's Style Invitational asks readers to take any word from the dictionary, alter it by adding, subtracting, or changing only one letter and supply a new definition. Ignoranus: A person who's both stupid and an a_ _hole. 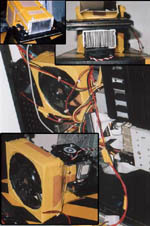 I guess when you can't work on a Macintosh there are certain modifications that you have to make to get your PC to function correctly (like these fan adapters). Fortunately, we have duct tape. Enter our latest Duct Tape Photo Caption Contest and see who won last month's contest. Click here. You probably figured it out by now, but this whole site is created on a Mac by a Mac-Addict since 1984 ("I'm still trying to convert Jim." - Tim). Duct Tape Ram Horn Enhancer. Envious that the other rams have bigger horns than you? No special pills are needed, it's duct tape to the rescue! Just build your horns as large as you like - their silvery glow will make you the king of the farmyard! RANDOM WINNER: The random winner of a duct tape book in this issue : Devon Palmer... Congratulations! Send us your mailing address and we will send you an autographed Duct Tape Book.